Dwayne Johnson's movie career is quite the colorful one filled with a good number of action roles and genre movie credits as well. He's pretty flexible as an actor that way although it's easy to dismiss his movies as being a little middle of the road. 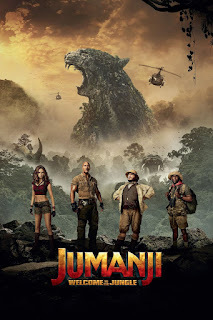 I wasn't too keen on seeing Jumanji: Welcome to the Jungle as it was both a Dwayne Johnson movie and an unexpected sequel to the original Jumanji that felt like some studio executive's idea that had come out of nowhere. But the friends who did get to see the movie before we did actually recommended it and cited how enjoyable it was. So that sort of deal admittedly got us curious enough to get around to seeing it just to find out what the fuss was about. And surprisingly, the movie was a lot more fun than some of the reviews had made it seem, at least for us. It's not a perfect movie nor one that would win awards but it was great entertainment. Synopsis: Jumanji: Welcome to the Jungle is an American fantasy adventure comedy movie directed by Jake Kasdan. It's a sequel to the 1995 Jumanji movie and the screenplay was written by Chris McKenna, Erik Sommers, Scott Rosenberg, and Jeff Pinkner. The movie starts with a flashback to 1996 where Alex Vreeke (Mason Guccione) receives the Jumanji board game after his father found it by accident. He ignores it initially but it then adapts to the time period and transforms into a console game system. When he finally notices the new game and tries playing it, he is sucked into the TV screen in the same way the original board game had captured players. Fast-forward to modern times and an unlikely group of teens all get sent to detention together. They are then sent to the school basement to serve out their detention. These include Spencer (Alex Wolff) the nerd, Fridge (Ser'Darius Blain) the jock, Bethany (Madison Iseman) the mean girl type and Martha (Morgan Turner) the feminist rebel. Fridge finds the old Jumanji console and in time they all decide to play the game and thus get sent to Jumanji. There they take on new appearances based on the characters they had selected - Dr. Smolder Bravestone (Dwayne Johnson) the archeologist hero, Franklin "Mouse" Finbar (Kevin Hart) the zoologist, Professor Shelly Oberon (Jack Black) the cartographer and Ruby Roundhouse (Karen Gillan) the martial artist dance fighter respectively. And now they need to figure out how to defeat the game and finally escape. What I Liked: The whole people being represented by different in-game avatars was a surprisingly good plot device complete with silly game stats and ridiculous weaknesses. They made good use of the juxtaposition of who they were in the real world versus who they are in Jumanji to good comedic effect. And it helped that the in-Jumanji actors totally hammed it up whenever possible, which was necessary for the movie to really flow. The movie had some great moments of making fun of video game behavior while contrasting it with sort of normal human actions. They even found a way to incorporate the whole limited lives mechanic to interesting effect. Throw in some fun special effects moments and the movie certainly keeps one entertained for quite a bit. What Could Have Been Better: The plot of the movie is a rehash of the first movie to a sad degree with the limited addition of needing to teach each of the teens some important lessons. This was tied to their chosen character roles and that sort of made sense by the end but of course it was a little forced more often than not. 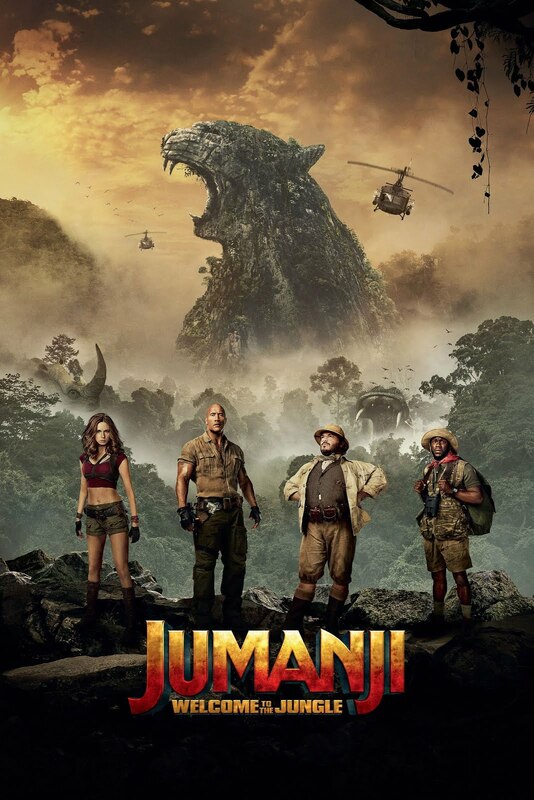 And the internal rules of Jumanji didn't quite make sense, especially centered around the antagonist Russel Van Pelt (Bobby Cannavale), who was a bit of a throwback to the first movie but not much else. His power set in the "game" felt terribly off-balance as they had to do away with resolving individual action spaces like in the first game. In the end it all felt rather flimsy and his ending didn't really add that much more value since they had to go super crazy with the video game stunts and impossible physics. TL;DR: Jumanji: Welcome to the Jungle is a fun movie that plays it a little safe by really sticking close to the original story but adds enough twists to keep things interesting. Don't think too hard about the plot and just enjoy the ride. And Nick Jonas. Thus the movie gets a good 3.5 references to the original Jumanji out of a possible 5.